The Quartzsite Sports, Recreation and RV show offers some great products for RVers. 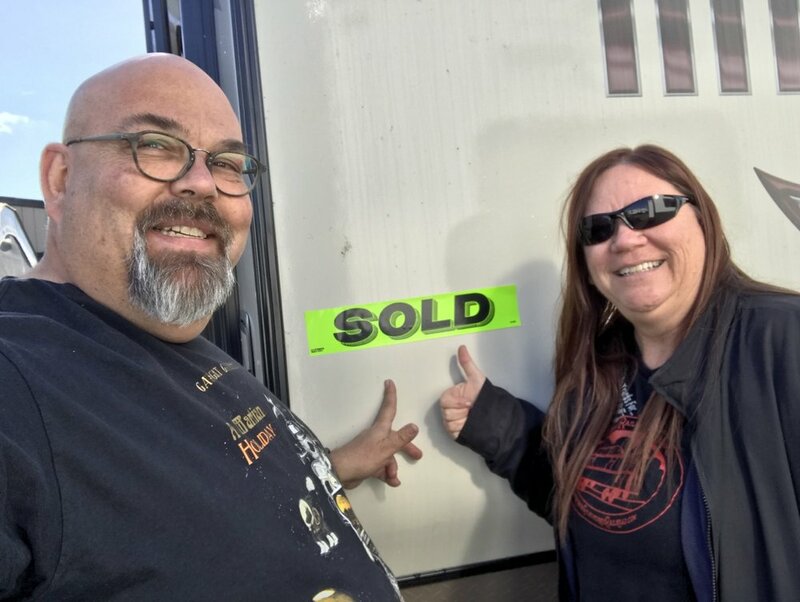 There are all sorts of products RV owners can use to make the experience better, more affordable or just more fun. I didn’t quite realize all the stuff we “needed” until I got home and saw our credit card bill. 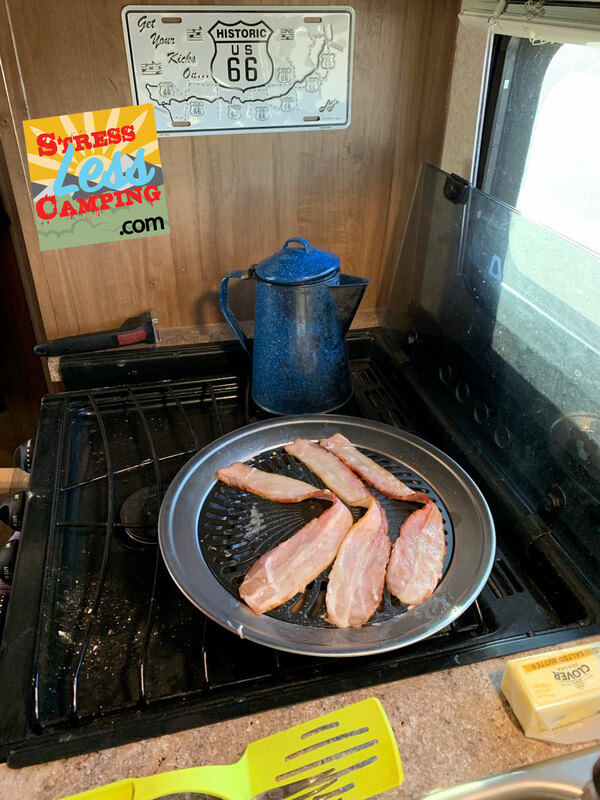 So here is a list of must-have things we must have needed that we brought home from our recent RV trip to Quartzsite. Peggy with the results of what we cooked-up with our Grubstick barbecue tools. Forget the nasty bent-up coat hanger you use to roast weenies and burn marshmallows, the Grubstick is the coolest campfire accessory around. This is basically a kit that contains a “cage on a stick” designed to contain s’mores, another designed to contain a hamburger patty, small and large cylinders and other pieces that attach to a telescoping stick. All the components are food-grade stainless steel and have all the pieces you’ll need for the campfire cook out. Every bit is well-made and well thought out. 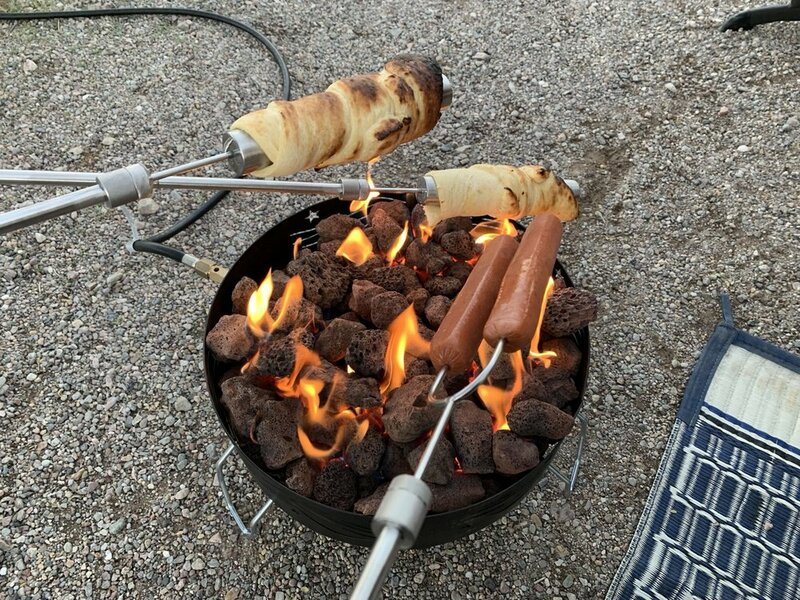 The stick comes in two sizes; the longer one is specifically designed so you can wrap it in prepared dough (like Pillsbury crescent rolls) and fits perfectly around the hot dog you’ve grilled with the spikes that interchangeably fit on the telescoping sticks. The stubby one can make a “cup” out of this dough which would be great for holding soups, chili or whatever else you can think of. Or, use the included clip and make that cup out of bacon to contain your scrambled eggs. Our 2017 travel trailer came with a whole-RV water filter and we’ve had a Camco external filter on it as a secondary step. But this didn’t compare to the three-stage water filtration system we had to have and we liked the one sold by M&T Enterprises from San Jose, California. There will be a full article on these systems in the near future but, to sum it up, this system first filters out the larger particles, then the smaller particles with a carbon filter, and finally there is a water softening stage. I have no idea how all those little rocks bypassed our old water filtration system but, suffice to say, I had zero issues with them after flushing our system and installing this. Those little rocks kept gumming up our toilet and kitchen sink - not any longer! Of course, another thing I did was use this three-stage external filter to fill our fresh water tank when we were boondocking. In the past I’ve just filled it straight out of the hose. Now, even if we fill from a source with less-than-perfect water, our filtering system will make it better. Our Murphy bed made-up with the RVSuperbag that we bought. RV beds are all not quite the same size as home beds and many of them are shoved in corners or otherwise placed in spots where making the bed is a giant bother. We’ve been looking at Beddy’s Beds which solves this problem, but hadn’t made the commitment. When we saw the bedding at RVSuperbag we threw down our credit card faster than a card shark in the Wild West. In many ways you could liken the design of the RVSuperbag to a sleeping bag including the zippers on the sides. But the RV Superbag also has a sheet that is held inside with hook-and-loop fasteners so it’s not twisting around while you sleep. The foot of the sheet is stitched shut so our feet stay cozy inside. Lots of details in the RVSuperbag including winter and summer sides and rounded-edge hook-and-loop fasteners. The best part is, making the bed is simply zipping up the zipper. I zipped my side up at night while sleeping, Peggy kept hers unzipped. There are a lot of little details that have clearly been thought through, such as the hook-and-loop fasteners with rounded edges so they don’t poke you in the night. Another detail on these is that there’s a winter side and a summer side with the winter side being better insulated. I’m really happy with this purchase. Did I mention no longer having to make the bed. Using our new Camco camp fire and our Grubstick cooking tools. This was a place I visited a lot. I bought a wrench to open the sewer pipe - which worked out well since I couldn’t open the one at our campsite. I also have been listening to Janine Petit’s podcast Girl Camper, one of our favorites, and she keeps talking about how much she loves her Big Red Campfire. Well, now I love mine, too. This is a gas-powered campfire which you can use even in places where wood fires are prohibited as there are no sparks nor hot ash. The lava rocks in the bottom heat up - I measured them at over 800 degrees! We also used this for outdoor cooking using another thing we had to have. We try to keep a duplicate of just about everything we need in life in the camper, so we don’t have to think of packing them. Something we’ve never thought to duplicate are now stocked and ready for any trip: nail clippers in two sizes, a pair of tweezers, and a mending kit. We discovered that we didn’t have any kind of thermometer with us. 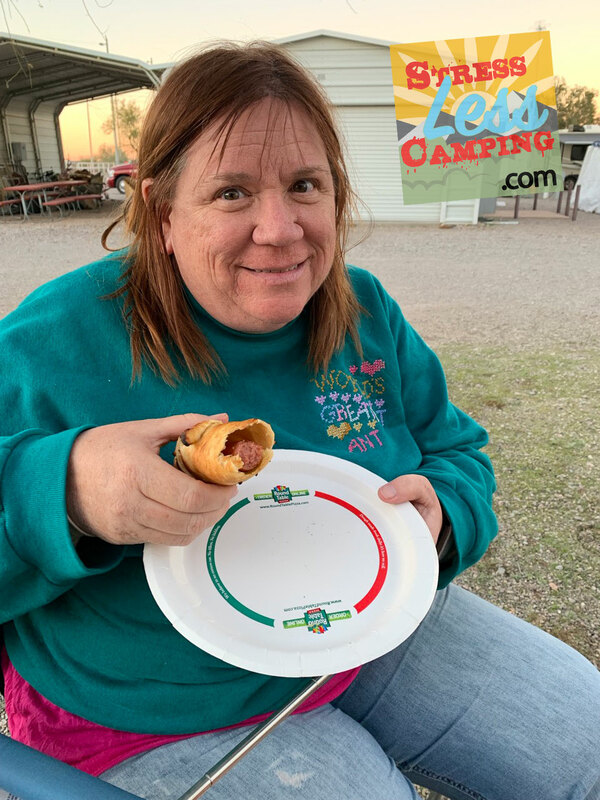 We got an instant-read point-and-shoot thermometer which is a handy tool for spot-checking dinner as well as the trailer tires and bearings after a long stretch of driving. Now we have a permanent camper thermometer. We found some kitchen scrubbies that, unlike a sponge, don’t trap mold and mildew so they are great for leaving in the camper and not having to replace on every trip like we used to do with sponges. They are made of nylon so safe for all surfaces. We bought several (will use some in the house as well) in various cute fruit shapes like lemon and watermelon. Small and mighty, our new set of collapsible silicone storage containers is perfect for the camper - when not in use, the bowls collapse to about an inch tall. When there are leftovers to contain, just pop the right size bowl and fill it up! I liked that I could squeeze it back down to half size as I used some of the food out of the container. And, because we bought two sets, the vendor threw in a set of sliding bag-sealer sticks similar to the GripStic set we have in the house. We had a friend that stopped by the house every day that we were gone and fed our cat. I wanted a nice souvenir gift to bring home to her. I found a lovely welded metal cactus statue with colorful flowers, that reminded us of the desert. It will add a nice splash of color to her patio, and she won’t have to worry that the kids will break it.